The stigma surrounding mental health is preventing firefighters from getting help and contributing to high rates of PTSD and suicide among firefighters. A mother accidentally backed over her toddler’s head with a car. Tim Casey, a firefighter/paramedic in Colorado Springs, was called to the scene. The woman handed the child to Casey, begging him to save her baby. The child died shortly after. Casey recounted this traumatic experience and many others in his video diaries. Casey would go on to take his own life in 2015 after years of struggling with PTSD and depression -- the result of witnessing tragedy after tragedy on the job. 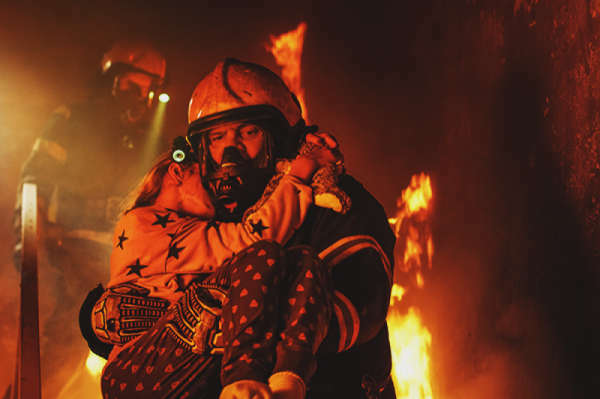 We view firefighters as invincible heroes but often forget that they are humans too. Firefighters and the harsh conditions they endure have entered the spotlight as 15 wildfires burn across the state of California. This begs the question: how do these stressful situations impact the lives of firefighters after the flames have died down? Post-traumatic stress disorder (PTSD) is one of the most prevalent mental health issues among firefighters. It is no surprise that many firefighters and paramedics are haunted by the tragedies they witness as a part of their job every day. Whether it is a fatal car crash, burn victim, suicide or the death of a child, these encounters take a toll. InMyArea (IMA) spoke with Dan Conroy, a captain and paramedic at the Laguna Beach Fire Department. Conroy notes that many fire departments run in 24 hour shifts, meaning that firefighters work for an entire day straight. At the Laguna Beach Fire Department, there is no cap on the number of hours a firefighter can work consecutively. In some instances, wildland strike teams can work up to 23 days in a row. During that time, firefighters may be exposed to numerous traumatic events, without a chance for relief. These lengthy shifts often consist of physically and mentally strenuous work, which can lead to physical and emotional exhaustion. Conroy says “I personally think that the main factor for mental illness in the fire service is the cumulative effect of all the incidents.” The fire captain also notes that he has seen the impacts of mental illness on his fellow firefighters during his time in the profession. Some studies estimate that up to 37 percent of firefighters are dealing with PTSD. This suggests that firefighters may suffer from PTSD at a rate similar to, or even higher than, military veterans. The U.S. Department of Veterans Affairs estimates that the rate of veterans with PTSD ranges anywhere from 11 to 30 percent, depending on the war in which the veterans served. While it is widely known and understood that many veterans suffer from PTSD, the impacts of this disorder on the firefighting community are less well-known. PTSD is frequently linked to other behavioral health issues, such as depression, substance abuse and suicidal behaviors. In fact, some studies have found that PTSD is accompanied by another disorder 85 percent of the time. It is estimated that between two and nine percent of the general population has attempted suicide. This means that firefighters attempt suicide at around twice the rate of the general population. A study conducted by the Ruderman Family Foundation found that in the year 2017, 103 firefighters died by suicide, while 93 died in the line-of-duty. Miriam Heyman, Ph.D, a co-author of the study, estimates that less than half of firefighter suicides are reported, so it is likely that these numbers are actually much higher. These discrepancies may occur because there is no nationwide government tracking system for firefighter suicide rates. This means that it is up to individual fire departments to report instances of suicide; however, many departments do not collect and report this data either. While mental illness in the general population is well documented and studied, there is a lack of research and awareness when it comes to the mental health of firefighters. When a firefighter dies on the job, there is a great deal of media exposure about the death. But when it comes to suicide, “the silence is deafening,” Heyman says. There is a stigma tied to seeking help for mental illness among firefighters, as it can be seen as a sign of weakness. To admit that something is wrong would be to admit that there are “chinks in the armor.” This prevents many firefighters from seeking help and learning how to cope with PTSD. One study found that 92 percent of the firefighters surveyed were unwilling to get help because of this behavioral health stigma. It does not help that firefighters are also very distrustful of outsiders. Each fire department is a close knit community, with members often referring to one another as brothers and sisters. There is a concern that an outsider, like a counselor or psychologist, would not understand what firefighters go through on a daily basis. Many worry that a counselor would not keep their discussions confidential. During IMA's talk with Mark Lamplugh Jr., a former captain at the Lower Chichester (PA) Fire Company, more was learned about these fears. Lamplugh believes that another large concern among firefighters is that they will lose their jobs if they ask for help. Many do not understand their rights to job protection when it comes to mental health. Even if they knew that they would not be fired for seeking help, individuals worry that they will be discriminated against by their crew for showing weakness. This mental health stigma is preventing firefighters from receiving the help that they need, which could eventually lead to the development of even more severe health problems. It also keeps the discussion of behavioral health under wraps, making it a taboo subject. So what can be done to remove this stigma? A study conducted by graduate student Gemma Isaac at the University of British Columbia examined behavioral health among firefighters and their attitudes toward psychological help. Isaac found that firefighters who reported high levels of social support in their lives also reported experiencing low levels of occupational stress. This suggests that it is important for firefighters to have someone to talk to for support in order to alleviate the stress that contributes to PTSD. Isaac also found that firefighters prefer confiding in someone that understands the nature of the job, its culture and the tragedies experienced. The firefighters surveyed also voiced a need for feelings of trust and confidentiality when choosing someone to talk to. Talking to an external counselor may not be the most viable solution, as many firefighters are distrustful of outsiders. This is where peer support teams come in. 83 percent of participants found debriefing with an internal support team after a critical incident to be the most helpful form of support. The peer support model is all about firefighters helping other firefighters cope with mental health issues. This model also strives to raise awareness and normalize the discussion of behavioral health within fire departments. Members of peer support teams have specialized behavioral health training and a vast knowledge of local resources for firefighters who are in need of help. These teams visit firehouses to create awareness for the program, check in on teams that have recently experienced a traumatic event, educate firefighters on mental health, and are available for support upon request. Peer support teams give firefighters an opportunity to talk to someone who understands what they are going through and that they can trust. This model is advocated by firefighters across the country, including all of those we spoke with for this article. In addition to lecturing on behavioral health topics, Brandon Dreiman is certified by the International Association of Fire Fighters (IAFF) as a peer support master instructor. He is the coordinator for the peer support team at the Indianapolis Fire Department, and he also helps departments across the country establish their own peer support teams. Dreiman has seen the success of this model, as more people are seeking help and starting a conversation about mental health than ever before. The peer support model is both proactive and reactive, which Dreiman believes is one of the main reasons it is so successful. Dreiman says “traditionally, firefighter behavioral health has been reactive (i.e., something bad happens, and we see what they need to correct it). While we still have that reactive methodology for requested visits and traumatic event responses, we are also very proactive.” Peer support teams visit firehouses and firefighters that have taken time off, just to check in and create an opportunity for conversation. Dan Conroy notes that "most firefighters don't recognize the signs or symptoms of mental stress or illness." This means that firefighters may not understand what they are going through or how to deal with it. Because the peer support model is proactive, it allows support teams to make firefighters more aware of the symptoms of mental illness, so that they can seek help early on. By being proactive and discussing mental health issues rather than repressing them, support teams seek to break down the stigma. It is important to know what mental health resources are available in your local community, and whether or not they can be trusted to maintain confidentiality. If the team isn’t familiar with these resources, they will have nowhere to send crew members that need professional help. There are several peer support training programs for your team. Dreiman recommends the IAFF 2-Day Peer Support Live Skills Training Program. There are also free training resources online for psychological and stress first aid. Another free online training course is the Counseling on Access to Lethal Means (CALM) course put on by the Suicide Prevention Resource Center. Lastly, suicide awareness training is very helpful, with programs like safeTALK and ASIST from LivingWorks. Implement the proactive peer support practices discussed earlier. These methods are essential for normalizing the discussion of mental health and eliminating stigma. Ali, Denaq. “Can Peer Support Prevent Firefighter Suicide?” Fire Engineering, 1 Nov. 2017. Bryner, Jeanna. “Photos Show Horrifying Scenes from California Wildfires.” Live Science, 13 Aug. 2018. “CALM: Counseling on Access to Lethal Means.” Suicide Prevention Resource Center, n.d.
Conroy, Dan. Personal interview. 20 Aug. 2018. Dreiman, Brandon. “Health & Wellness: Firefighter Peer Support.” Firehouse, 1 Aug. 2018. Faultlines. “The Final Call: Why Firefighters Commit Suicide.” Al Jazeera, 30 Nov. 2016. “Find a Training.” LivingWorks, n.d.
Fire Chief. “Firefighter Suicide Tackled in New Studies.” Fire Chief, 15 Aug. 2016. Fire Engineering. “PTSD Rates Soar Among Firefighters.” Fire Engineering, 8 Nov. 2017. Hayes, Christal. “More Officers, Firefighters Died of Suicide than Line-of-Duty Deaths in 2017.” USA Today, 11 Apr. 2018. “IAFF Peer Support Training Information Guide.” International Association of Fire Fighters, n.d.
Isaac, Gemma. Extinguishing Stigma: An Examination of Firefighter Stress, Social Supports, and Attitudes. 2018. University of British Columbia, MA, Thesis. Lamplugh, Mark, Jr. Personal interview. 14 Aug. 2018. Lamplugh, Mark, Jr. “Responding to Your Own Mental Health.” Firehouse, 21 Apr. 2016. “PTSD: National Center for PTSD.” U.S. Department of Veterans, n.d.
Ruderman Family Foundation, Ruderman Family Foundation. 2017. Russell, Jenna. “First Responders can be Haunted by Close Encounters with Suffering and Death.” Boston Globe, 28 July 2018. Stanley, Ian H. et al. “Career Prevalence and Correlates of Suicidal Thoughts and Behaviors Among Firefighters.” Journal of Affective Disorders, vol. 187, 2015, pp. 163-171. “The National Fallen Firefighters Foundation Issues a Statement about Suicide Prevention.” National Fallen Firefighters Foundation, 15 Aug. 2014.